Since opening our doors in May of 2009, Lobby on York - Modern Steak & Seafood has quickly become Winnipeg's hottest dining destination. Our close proximity to the MTS Center makes us the best choice for a meal before the game or concert. 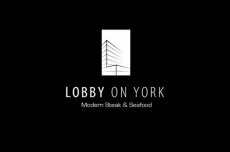 With the nearby Convention Center and major hotels, Lobby on York is ideal for visitors to Winnipeg. We offer the finest cuts of beef, flown in fresh fish and seafood in which we prepare and present with modern flair. Join us in the lounge for a more casual experience. We offer nightly and weekly specials to satisfy all palates. With more than 150 seats in the dining room and 70 in the lounge, we are the perfect venue to host a private function. If you prefer to let loose at your home, we would love to cater that for you. At nights end, your friends will tell you "that was the best damn party ever".